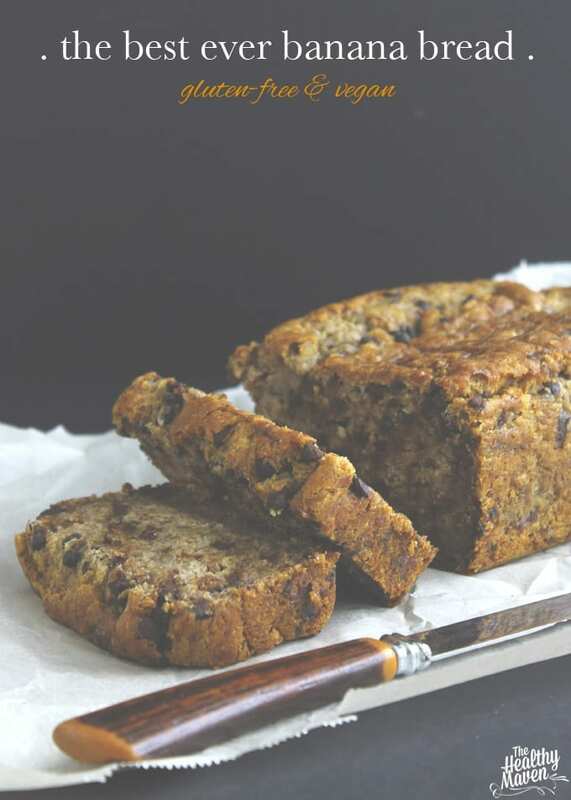 A recipe for Gluten-Free and Vegan Banana Bread that tastes equally as delicious as your traditional banana bread. No one will know it is gluten and dairy-free! I often get asked why my recipes use certain flours/starches and why some are vegan while others are not. 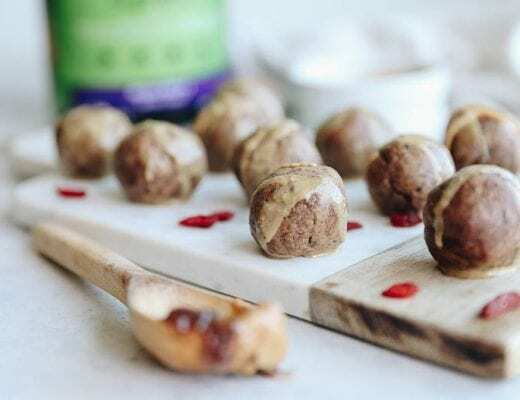 My recipes are almost always gluten-free because I eat gluten-free (most of the time), but as I’m sure you’ve discovered I am certainly not vegan or paleo or follow any real diet for that matter. Honestly, there is no rhyme or reason to it, my recipes come out the way they do entirely based on what I have on hand. Sure I make the occasional grocery shop, but especially when it comes to baking there’s always different combinations that can yield the same result. I’m not about to go running out to the store to buy cornstarch and buckwheat if I already have tapioca flour and brown rice flour on hand. Same goes for eggs. If I’m out but have some flaxseed in the fridge, flax egg here we come. When there’s a will there’s a way! Of course I’m also a sucker for a good science experiment. A while ago I read that mixing applesauce and baking powder can act as a binder instead of eggs. Obviously I forgot to write down where I read it or how to do it, but I gave it a shot and the baking gods must have been on my side because it actually worked out in this recipe. I really had no intention of posting this recipe when I was baking it because I made it last-minute for C when I visited Montreal a few weeks ago. I sneakily made it gluten-free so I could eat it too. He was shocked at how good it was despite its “healthiness” (healthy food can taste good people!!!) that I knew I had to recreate and photograph it. 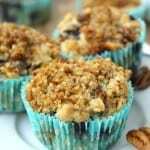 I then made them into muffins when I catered and fooled everyone there too. I declare myself the banana bread queen because damnnnnn this.is.good. In a separate bowl mash up bananas. Add in warm applesauce (premixed with baking powder), melted coconut oil, maple syrup, almond milk and vanilla and stir to combine. Add in chocolate chips or nuts if desired. Scoop batter into pan and bake for 55-60 mins. Remove from oven and let cool for at least 30 mins before removing from pan and placing on a wire rack to cool completely. Will keep in a sealed container on counter for up to 5 days. Or replace brown rice flour, oat flour, tapioca flour and potato starch with 2 1/4 cups + 2 T of regular all-purpose or whole wheat flour. Like this recipe? Check out some of my other baked goods! Do you like experimenting with different types of foods or do you stick to what you know? What’s your “best ever” recipe? It’s like the secret ingredient for all gluten-free baking! I must make this!!! Banana bread is my fav!!! I adore banana bread! This looks amazing and I want to make it ASAP, but I have no ripe bananas on hand. I hate it when that happens! I tend to experiment with vegan and GF baking too because I have a friend who is both. Also a lot of my recipes naturally come out vegan just because of the nature of the recipes. Yum! That sounds wonderful! I never got to try any banana bread….but I do have some bananas that are ripening a little faster than I can eat them….Thank you for the perfect timing! I experimented a lot while gf, and I think it is easier to get it wrong as it is so complicated with all the flours, I had quite a few mistakes, many of my pancakes came out like a blob of fried oatmeal…..not so good, but I learned that gluten free pancakes are better smaller, compared to my usual giant ones! Thanks for the recipe, and for proving that life is for experimenting…and sometimes it even works! Oooo this looks and sounds fantastic! I’ve never used tapioca flour before, but if I ever come across it in the stores, I would totally try it out. I usually stick to recipes I know, but occasionally, I go crazy and buy new things to try new recipes, and it’s often worth it! I find new foods, tastes, and textures that I love. That banana bread does look SO moist (ew don’t like that word: moist). I want to try someeeee! Eat all the banana bread!!!! I’m waiting (impatiently) for some bananas to ripen so I can make some. PS thanks for the multiple flours explanation. I always wonder if like, tapioca flour in a recipe means that you absolutely have to use that specific flour in order to make it work. There’s usually ways to sub around it. I’m working on a more detailed post explaining everything! this looks so good. expect me to steal this idea too. Steal away but Kayla is gonna know Mommy didn’t pull this off! I love how unafraid you are to just get in the kitchen and experiment! I’m always so scared something won’t work when I just wing it with baking. This loaf turned out beautifully!! I’m definitely among those who experiment frequently. I’ve taken out a number of ingredients and foodstuffs from my eating regimen in recent years and life would be truly boring and depressing if I did not experiment. I’ve been looking at GF bread recipes lately (I’ve missed bread and as a result have tasted a slice of a friend’s homemade bread which I’m pretty sure was not GF and probably had eggs) and this one looks right up my alley! I’m so happy you like it! If you’re looking for regular sandwich bread I’m a big fan of Udi’s Whole Grain sandwich bread and a GF flour company called Cloud 9 bakery just came out with a bread flour. I love their regular flour so I’m sure it’s good! You are my hero!!! I CAN EAT THIS!!! The only things I have to sub are the almond milk and the starches (don’t have that here). And maybe add some cacao nibs, lol. So EXCITING to finally see a recipe that I love and can eat at this sad time of eliminating. My mouth is watering already, this looks amazing! Next time I have really ripe bananas I know what I need to make!! I love love love banana bread! Thanks for sharing the flour swap, too, since I usually just have regular flour on hand. My best ever recipe? That’s tough, since I don’t really consider myself to be a good cook. Riley would probably say my breakfast casseroles are really good! I’ve never seen the applesauce and powder trick! How cool is that? I’ve been craving a batch of banana bread, but I like to try a new version every time. I’ve never tried vegan, but this looks so darn good, I can’t resist. So thick and moist and dense – my trifecta of perfection in quick breads. Yes sir-ree, you are the queen of banana breads! Pinned! This looks so good!! Interesting about the applesauce and baking powder hmmhmmm may have to try! And yeah I’m still trying to convince Miguel that healthy food can taste good haha it’s a work in progress. I love experimenting with different flours too. I’m not vegan, but lots of my recipes are, mainly because vegan recipes tend to be healthier. I love your pictures and the addition of applesauce. I’m a sucker for any banana bread recipe. It’s just so darn good. I always cook/bake vegan (obvs) but I like experimenting with GF as well. Grant’s sister is GF so I use her as my taste tester for new recipes. All hail the banana bread queen! We bow down to you oh Davida the Great. So this has real cooked brown rice in it? That’s super cool. I bet it would have a crazy good texture. I never would have thought to add that! Don’t you love surprising people with healthy food? And my brother’s girlfriend is gluten and dairy-free and I always feel bad that I never have anything for her when i bake…I may have to make this up for Superbowl! How did it turn out?!? woman, you were not lying about the ‘best-ever’ part. It was so good! hehe yay!!!! Any leftovers? I’m hungry…. This looks awesome! Banana bread with chocolate chips and nuts is the best! I once even put peanut butter chips in it too…amazing! I just made banana bread last weekend because my husband loves it. It’s one of his favorites! However, I love this healthier version of it. Definitely need to remember this one! I completely understand about a all over the place diet! Mine is too other than no dairy… allergy! Adding this to my list to make! Gunshow loves BANANA bread so I think this will excite him since it is a healthier version!!!!! YES I have tried every loaf. I only speak the truth! I have actually never tried making a gluten free banana bread, great recipe, maybe I should give it a shot. LOVE THE BAKING POWDER + APPLESAUCE TRICK. My stuff always falls apart. Probably because it’s literally like bananas-applesauce-other stuff that is healthy. I also ALWAYS forget eggs or baking powder/soda if I’m making something on my own. Slowly but surely I’m picking things up and learning more things every time. I haven’t experimented much lately (minus the amazingness that is quinoa breakfast muffin) – actually, just kidding, I thought about four things I’ve made lately. I’m such a liar. Oh this looks so moist! I have been making Green banana muffins to have for breakfast throughout the week. I might have to try this recipe next time…. Maybe I could add spinach too. well whatever you’re doing it’s working!!! I don’t have a ton of time to experiment. I’m lucky when I actually get dinner on the table 😉 This looks easier than I thought… but please, chocolate chips are not optional. I looooove banana bread and the fact that you put chocolate chips in it makes you my hero! Looks delicious! I’ll have to keep this one in mind. I see a lot of kiddos that can’t have gluten or cow’s milk so this would be perfect!! Yum! I love banana bread, especially if it’s a healthy one 🙂 My best ever recipe would probably have to be my healthy cheesecake or sticky toffee pudding! I’m not a cheesecake person but I would do just about anything for some sticky toffee pudding right about now! Can you do readers requests and do no bake recipes? This looks so good, especially without eggs!!! I love experimenting- often though they do not lead to success…. I’ll focus on meat smasher recipes from now on k? Unfortunately, “healthy” food can get a bad wrap of tasting bad. Poo, poo on those haters! These pictures absolutely show that healthy can look AND taste delicious! I wish I was as good as you with substituting ingredients on the fly! Girl you’re pretty impressive if I may say so myself! Go ahead calling yourself the Banana Bread Queen because even without taste-testing this I can tell it’s aaah-mazing. 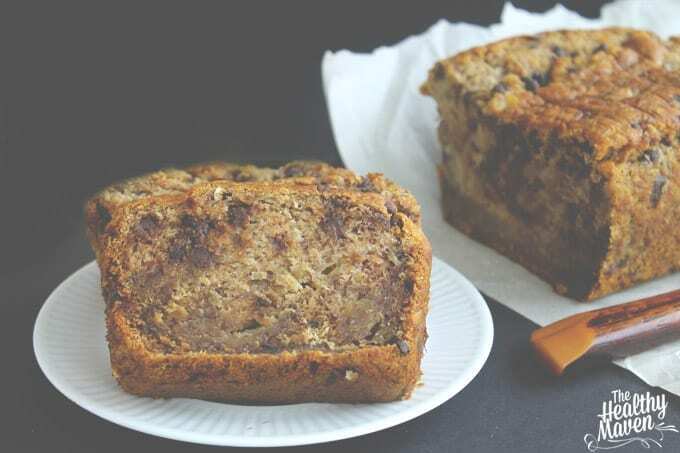 Not like I’d ever had banana bread before – it’s not a classic over here – but the ingredient list alone is a guaranteed winner. Next year I’m getting invited to your birthday lunch! Those sound fab! I absolutely love banana bread. this looks fabulous. I’m lame and boring and stick to what I know for the most part but I’m slowly branching out – very slowly!!! I’ll come deliver it personally! I need beach in my life! Girl, I get so excited for posts that begin with “Best Ever”. They make me real excited. This bread is awesome and I can’t wait to eat the entire thing (in multiple sittings – of course). I love me some banana bread!! I never have a rhyme or reason for my baking either. I just try things and see if they work! Oooohhh I love chocolate chip banana bread!! I have a vegan recipe that I use to make it, but I may just have to try your version my friend. That Banana Bread looks wonderful and I love that applesauce/baking powder trick. Awesome! I loooove banana bread! I have yet to ever make any myself though… maybe this will be my first attempt! I love banana bread. I get so excited when I start to see the bananas turning spotty brown, those are the best for baking. 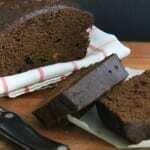 Gluten free can be tricky but this bread looks delicious! The best! I keep at least 10 ripe bananas in my freezer at all times! Davida, this looks so moist & incredible. I want to slather it w/ an ambundance of nut butter and raisisins! You have no idea how badly I want this right now. Mostly because I’m PMS’ing and I can’t stop eating everything in sight. You know how I bought all of that cereal the other day? I fell into a black hole of granola last night – it was embarrassing, really. Sometimes I think my whole life is one long PMS sesh call I’m so damn bitchy and want chocolate all the time. this looks absolutely delicious! 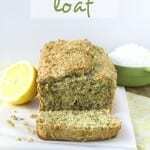 I love banana bread as a nigh time snack and really anytime! p.s: have you been having problems with your blog lately? I’ve been trying to read your Egg Pesto Slad post for a day now and it just won’t load : ( Maybe it’s just my computer, I don’t know. I had no idea about the applesauce and baking powder trick! Definitely keeping that in mind. I tend to bake a lot of GF stuff. This bread looks perfect! Thanks Laura! It’s such a sneaky trick. I was shocked at how well it worked! I apologize in advance for using this word because I know so many people absolutely despite it….but that banana bread looks so MOIST! And delicious. I must have it. Mmmmmm. haha I’m okay with the word moist but I had the world melon! I’m so weird..
Oh I love everything banana bread. This looks amazing! I bet it makes great French Toast the next day (although that may override the vegan party). I eat plant strong and gluten free which means I avoid oil. Sometimes I will eat a little coconut oil when it’s in small quantities but 1/4 of a cup is way too much for me. Any idea on substitutions? Normally I would use applesauce but I fear that would be too much in this recipe. Hi Jessica! Thanks for stopping by 🙂 You can definitely try to substitute with more applesauce (there’s already a 1/2 cup). You could also try sweet potato or pumpkin? It may not be as moist but it should still turn out pretty well!
. link love 2/2 . | . running with spoons . I LOVE banana bread! This looks mouthwateringly delicious. Thanks for linking up to Healthy Vegan Fridays! Please make sure to link this recipe to this week’s HVF post on one of the co-hosts blogs! I definitely like to experiment…hence why I can be all over the place with the pancakes…you know, when I’m actually making them! But I’m not at ALL confident enough in the baking realm to get too adventurous! I never knew that about the applesauce and baking powder! That’s awesome! I WILL be giving that a try! That and the thin mint pancakes are my fav pancake recipes (and pancake pictures!!!!) you are seriously a genius! This banana bread looks delicious. My Hubby would leap over tall buildings to get a slice of this because he loves chocolate chips in bread. Side question: I guess I didn’t realize it before, but are you gluten intolerant? 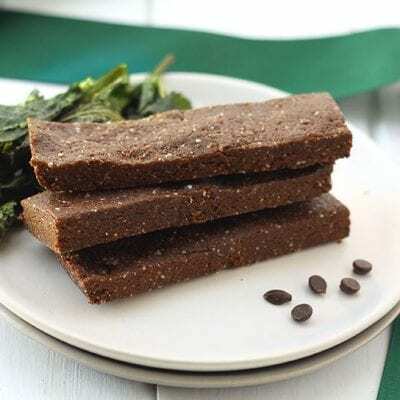 Healthy Vegan Fridays #4: Hemp-tastic Giveaway!hello, veggy! Hi lady! I just made this and it was AMAZING!!! I’ve been craving banana bread like crazy and stumbled across your page. I completely forgot to add the maple syrup but added a few chocolate chips and it is just sooo so good!! Thank you for this recipe! I’ll definitely be making this again! Hi Zilia!! So happy you liked it 🙂 I wrote optional for the chocolate chips, but let’s be honest when are chocolate chips optional?!?! Eat a slice for me! 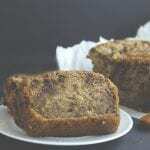 The best ever Banana Bread Gluten Free and Vegan. By looking at this bread you would never know that it is healthy bread. It looks so rich, yummy and just scrumptious. To die for and melts in your mouth. Awesome!!!!! Hey do you think this recipe would work in an automatic breadmaker where you put all the ingredients in at the same time? Curious to try! Thx, loving your recipes, keep em coming. 🙂 I’m also a big foodie and discovered what you were doing on instagram! It’s so inspiring to see you turning your passion a full-time job! I had a food blog for about a week but school busy-ness got in the way of regular posts – maybe I’ll start it up again sometime 🙂 I hope your blog keeps growing and more people know about it!! Thanks for the reply – I thought as much since breadmakers do the mixing automatically but I thought I’d test it out and see. I’ll let you know how it goes! I was skeptical at first. I bought all the ingredient which totaled about $50 because I do not do healthy-style, non-gluten cooking so I did not have anything laying around. Made the bread exactly as the recipe prescribes and WOWWWWW!!!!! It is the best banana bread I’ve ever had. It’s light on my stomach, delicious, dense, and most crucially, moist. I highly recommend the chocolate chips and a few walnuts. My passionate thanks to the author. The athletic team potluck I am going to tonight is going to love it. That is, if I don’t eat it all by then. 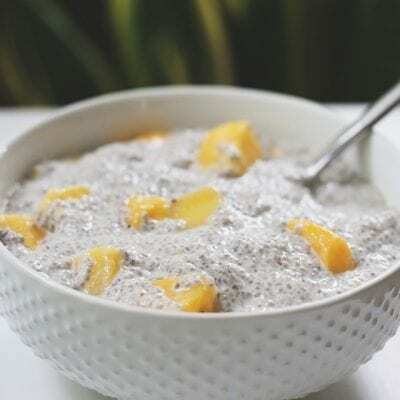 Did you use tapioca starch or was it tapioca flour? Thanks much. they’re the same thing 🙂 Hope you enjoy! Hi, instead of the apple sauce can I use an almond GF yogurt? What are your thoughts on using frozen bananas? I have about 4 on hand (no time to make banana bread when they were getting ripe, so off to the freezer they went!). Obviously, I would let them defrost. Hi Lisy! Frozen and thawned bananas would work perfectly well! In fact I almost always use frozen bananas since they were usually frozen because they were super ripe. Hope you enjoy! No problem! Hope you enjoy 🙂 Shabbat Shalom! Thank you very much. My girlfriend and I have enjoyed this recipe very much. However the only issue we have had is that the bread does not hold it’s shape when it cools. It looks fluffy and incredible when it comes out of the oven, but then quickly drops and flattens as it cools down. Is there a way that we can stop this from happening or is there something we can add to help it hold it’s shape? Thank you so much for posting this recipe. I have such blind faith in you that I QUADRUPLED the recipe. I am about to start making them, however, I am concerned with the “4 bananas” because they vary in size so much. I usually mash my ripened bananas down and freeze them. It would be incredibly awesome if you could give some sort of measurement either cups or grams of mashed bananas. Because they have so much of an impact on the density, moistness, and ultimate success of the recipe, I’m scared to continue. I only have the dry ingredients mixed right now. If you miraculously get this and respond soon, it would be so appreciated. I would hate to ruin 4 batches 🙁 Thanks SOOOOOOOOO much! Hey Juliana! You should be able to substitute all-purpose gluten-free flour for the flours but it may change the recipe slightly. You’ll notice that I use xanthan gum in the recipe, which is necessary for binding so make sure the gluten-free all-purpose flour you use contains xanthan gum (some of them don’t) otherwise the bread may crumble. Let me know how it goes! Confession: I don’t like bananas. I eat them medicinally (sometimes) and use them to ripen avocados. So it’s not uncommon for me to buy a bunch… and they just sit around turning nasty colors and making me dislike them even more. Such happened recently, and I decided I’d try to make the best of the situation. I bet you can’t guess how. 😀 Well, my bananas were really over-ripe (more black than yellow), and I worried they’d lend that super-banana taste and smell to the bread. It seems baking tames even the wildest of nanners, though, and the muffins are as advertised! I used white whole wheat flour, and uh-ohs, I just noticed I didn’t add enough baking powder… I’m not sure the copy of the recipe I printed is the same as what’s here anymore, but I may well have just overlooked it. I just put the 1 tsp in the applesauce and didn’t know/notice that there was a separate allotment for that purpose. Well, um, the muffins still turned out awesome! lol I got 15, though I didn’t fill the tins up all the way ’cause I wasn’t sure how much they’d rise when they baked. I don’t bake much. 🙂 I did add dairy-free semi-sweet chocolate chips to make sure my boyfriend could eat these without worry. Each muffin is surprisingly heavy yet isn’t dense. I heat mine up a little. They’re so moist and soft and amazing! Thanks so much for the recipe! Happy to hear they turned out despite the little mishap 😉 Sometimes baking can be forgiving. Or you had luck on your side! I have many a recipe for that 5th banana btw…I love me some bananas! Thank you for the applesauce plus baking powder trick! My kids are allergic to eggs and seeds, so finding replacements is always tough. I’ve often tried applesauce, but warmed up with the baking powder seems like it would make a better binder. Why so much potato starch? Can I substitute the potato starch for anything else? Hi! I had this in the oven for half an hour before I discovered the melted coconut oil in the microwave (that I forgot to add to the batter!). You know what, it’s STILL delicious! Thanks for this recipe, it’s great! 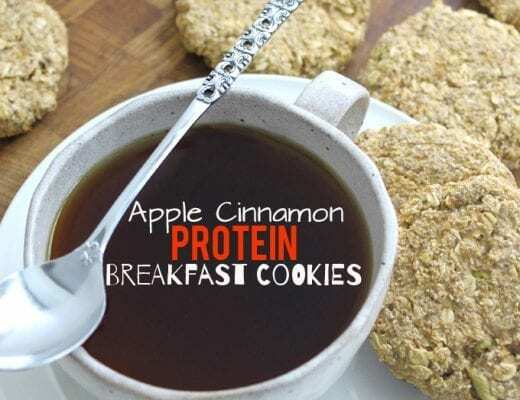 Apple Cinnamon Protein Breakfast Cookies + A Giveaway!